General Information: The longan is native to southern China, in the provinces of Kwangtung, Kwangsi, Schezwan and Fukien, between elevations of 500 and 1,500 ft (150-450 m). Closely allied to the glamorous lychee, in the family Sapindaceae, the longan has been referred to as the "little brother of the lychee", or li-chihnu, "slave of the lychee". It thrives much better on higher ground than the lychee and endures more frost. It is rarely found growing along the dykes of streams as is the lychee but does especially well on high ground near ponds. The longan is more seldom grown under orchard conditions than is the lychee. There is not so large a demand for the fruit and the trees therefore more scattered although one often finds attractive groups of lungan. The longan was introduced into India in 1798 but, in Indian literature, it is averred that the longan is native not only to China but also to southwestern India and the forests of upper Assam and the Garo hills, and is cultivated in Bengal and elsewhere as an ornamental and shade tree. It is commonly grown in former Indochina (Thailand, Cambodia, Laos and Vietnam and in Taiwan). The tree grows but does not fruit in Malaya and the Philippines. There are many of the trees in Reunion and Mauritius. The longan was introduced into Florida from southern China by the United States Department of Agriculture in 1903 and has flourished in a few locations but never became popular. There was a young tree growing at the Agricultural Station in Bermuda in 1913. A tree planted at the Federal Experiment Station in Mayaguez, Puerto Rico, was 10 ft (3 m) high in 1926, 23 ft (7 m) in 1929. A longan tree flourished in the Atkins Garden in Cuba and seedlings were distributed but found to fruit irregularly and came to be valued mostly for their shade and ornamental quality. In Hawaii, the longan was found to grow faster and more vigorously than the lychee but the fruit is regarded there as less flavorful than the lychee. The fruit is edible, and is often used in East Asian soups, snacks, desserts, and sweet-and-sour foods. They are round with a thin, brown-coloured inedible shell. The flesh of the fruit, which surrounds a big, black seed, is white, soft, and juicy. Longans and lychees bear fruit at around the same time of the year. Dried longan are often used in Chinese food therapy and herbal medicine. In contrast with the fresh fruit, the flesh of dried longans is dark brown to almost black. 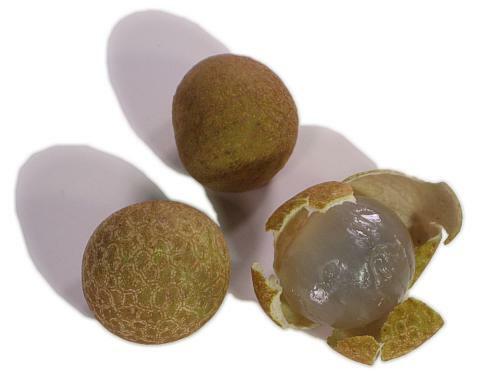 The longan or dragon's eye is the more temperate relative of the glamorous lychee. Many Chinese prefer the longan to the lychee since it has a distinctive musky flavor and is not overly sweet. The tree is better adapted to California than the lychee, particularly since it is more frost tolerant (22°F). The round fruit is smaller than the lychee. The outer shell is relatively smooth and dark tan in color. The aril surrounds a single (usually) large brown seed. The fruits are available fresh, frozen, canned and dried. Longans have less finicky fruiting habits than lychee. Propagation is costly since marcottage must be used. A market demand exists in the Asian community for the fresh fruit which is available only in limited quantities.